Web traffic is important but when our landing pages lack certain key elements that encourage user behavior, we convert and sell less. You’ve got traffic but are your visitors converting? 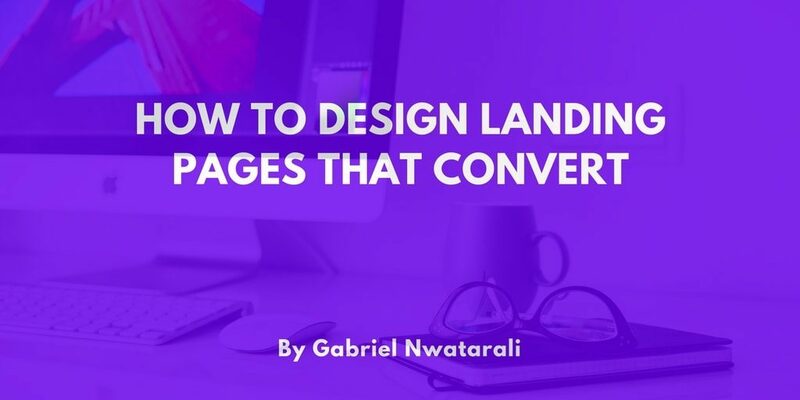 This guide will teach you the elements of great landing pages that convert. You see, a lot of online businesses struggle with conversion rates. They receive an enormous amount of web traffic only to convert at a rate between 1 – 5 percent. But it’s not because they’ve got bad products either, although sometimes this can be the case. It’s because they’re not paying attention to conversion rate optimization. Bonus: Download this free PDF that’ll show you 32 ways to increase your website conversion rate. Dr. BJ Fogg, a behavioral scientist and founder of the persuasive tech lab at Stanford University, created the Fogg behavior model. The model states that three elements must be met at the same time for a behavior to occur. Good designers understand this model and use it effectively. As a business owner or “solopreneur“, you should understand this too. Why? Because your business needs to encourage favorable behavior that ultimately increases your revenues. When we design landing pages at Tech Help Canada, we use the Fogg behavior model as a checklist. This ensures that we’re focusing on conversions, not just looks. A website can look great but it may not necessarily convert. Regardless of what conversion metric your business needs to track, you’re really trying to influence behavior. You want your website visitors to act or behave in a certain way on your website. That’s largely why many businesses continue to hire professional web designers with an understanding of human behavior. Part of your ROI for hiring a designer is the ability to influence behavior. But of course, there are other technical and beneficial reasons for doing so. Let’s take a more detailed look at the three elements. Will your customer be motivated to act? When visitors come to your web page, they’re looking for good reasons to trust you and act. You need to make sure that your web pages motivate the user enough to keep reading and potentially act. Most people on the web scan, they don’t read! It’s alarming when you think about it. So how do you motivate the user enough to keep reading? There are three primary motivators and these are sensation, anticipation and social cohesion. Sensation: The avoidance of pain or the promise of pleasure. Anticipation: Can you spark expectation or prediction? The sense of anticipation is a strong motivational factor. Social Cohesion: People like to be part of a group and generally want to act in a way that makes them part of something. If possible, try to create a sense of group identity on your landing pages. People hate complexity and making things seem easy will increase your conversions. If your customer needs a user guide to understand the checkout process, then you’re off to a bad start. As you increase simplicity, you increase ability and decrease perceived difficulty. A lot of people want something but are often unwilling to work for it. Harsh but has to be said. Facilitators – When the visitor is high in motivation but low in perceived difficulty. In this case, the user already has motivation so you’ll need to make it look really easy to encourage a favorable action. Sparks – When a person is low in motivation but high in perceived difficulty. This person thinks it’s an easy task but they’re not motivated to do it. Your call-to-actions should increase motivation by showing value! Also, don’t make a task look easy when it already is. Signals – When there’s no major lack of motivation or low/high level of difficulty. You simply need a straightforward and noticeable call-to-action. All of these triggers affect motivation and perceived difficulty. What’re people struggling with when they come to your website? Are they lacking in perceived ability or motivation or both? The AIDA principle has been a sales representative’s guide for creating effective sales presentation since the 1800’s! AIDA stands for attention, interest, desire and action. This principle should be used as a checklist but not the only one. You’ll need to apply the Fogg behavior model as well to create effective landing pages that convert. In an earlier publication, we discussed the sales funnel but it’s really a derivative of the AIDA principle. Attention: The consumer becomes aware of your product or service. Interest: They become interested in your offers after learning more about them. Desire: They develop a favorable impression about your business. Action: They make a purchase or take other favorable actions. Understanding the AIDA principle and Fogg behavior model will help you create better landing pages. In fact, it’ll help you create better websites. Everything that is placed on your web pages like your logo, images, text, testimonials and others should also serve to help encourage a favourable action.